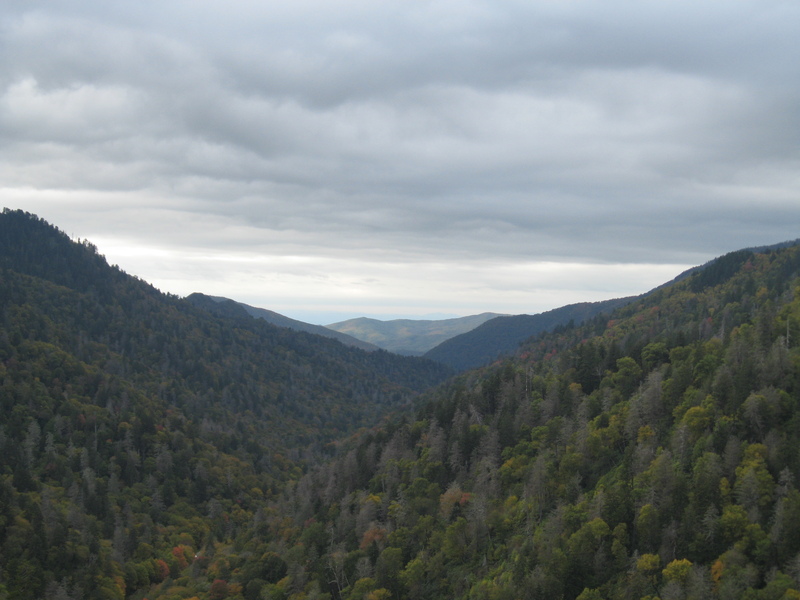 This is a great, longer article on the species being found in the Smoky Mountains. There are more species found here, than most other places on earth. There are a number of species that have been found only in the Smokies. If you have a couple of minutes, it would be well worth it to spend that time reading the article below. So far this year, the number of visitors to the Smokies is about the same as this time last year. According to the article below, about 54 more people have visited since this time last year. Considering last year more visitors visited since 2000, that means the Smoky Mountains are extremely popular. With the economy in the tank, the fact that the Great Smoky Mountains National Park is free probably means many people are vacationing there to keep vacationing. I think that’s a great thing. There is usually something good in everything if you look hard enough. 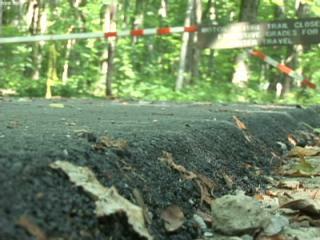 While the economy may be tanking, just think of the people who will learn more about the Smokies because of that. My guess is, many of those folks will be back for years to come. According to the marketers, 2,000 people claim to have gotten pregnant after touching either the fertility statue above, or another similar one now on display at Ripley’s Museum in Gatlinburg. If you need to get pregnant, I suppose it can’t hurt to touch them. If you’re like me, and don’t need another child at this time, you’ll avoid it just in case. Dollywood has announced plans for a new ride next year. Due to the economy, the announcement of new rides has not been as quick as it has been in the past. I’m looking forward to this new one. This will be a high flying ride built on a traditional barn building. There will also be other barn-themed fun things for the kids to do around the “barn.” This should be in place for next year’s season. Can’t wait to check it out. PIGEON FORGE, Tenn.–(BUSINESS WIRE)–High-flying high jinks take to the sky at Dollywood for the 2011 season with the new Barnstormer ride, a $5.5 million family thrill ride situated in a barnyard-themed area which also includes play areas for younger guests. The number one ticketed attraction in Tennessee, Dollywood is an award-winning 150-acre family adventure park located in Pigeon Forge near the entrance to Great Smoky Mountains National Park. Open nine months a year (late March to early January), Dollywood hosts four of the South’s largest festivals and offers more than 40 rides and attractions, including Thunderhead, twice named the world’s No. 1 wooden coaster, and Mystery Mine coaster, Theme Park Insider’s 2007 Best New Attraction. In addition to the 2009 Golden Ticket Award for Best Shows, Dollywood is the recipient of 15 Big E Awards in recognition of the park’s live entertainment which features country, bluegrass, gospel and Appalachian music. The Golden Tickets’ 2007 Publisher’s Pick for best theme park, Dollywood also is a two-time winner of the Golden Ticket Award for Best Christmas Event. In addition, a dozen crafters authentic to the East Tennessee region demonstrate daily. For more information, visit www.dollywood.com. Another great read below, from the folks over at Knoxnews.com. This time, they talked to volunteers who are there to help you learn more about the beautiful Elk in the Great Smoky Mountains National Park. The majority of Elk can be see in the Cataloochee Valley area. That’s where many of the volunteers work, answering questions, giving information and advice on the Elk who are flurishing in the Smokies. Personally, I’ve never been to Cataloochee (something I’m not proud of :). That is definately high on my to-do list for the Smokies, but as many times as I’ve been to the Smokies, I’ve yet to visit Cataloochee. It is a more remote area of the park for most visitors. 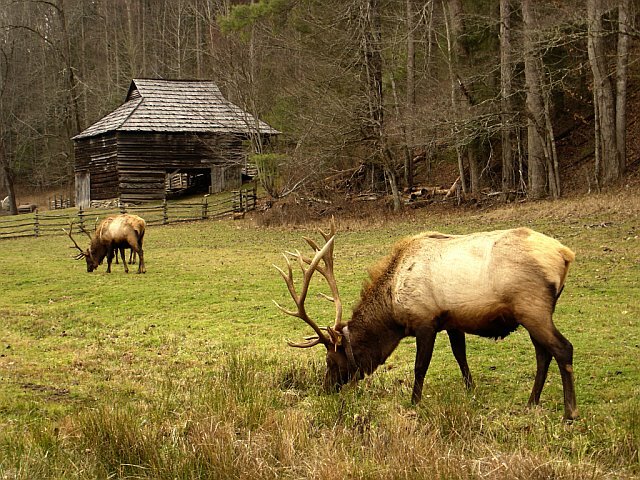 That’s one reason when the Elk were reintroduced, they were reintroduced to the Cataloochee area. On a recent trip, back in March, we DID see Elk outside of Cherokee in the park. They are magnificant. I highly recommend looking for them when you’re in the area. Ask where to find them at the visitor centers. They may be able to point you in the right direction. Once you get there, one of the many volunteers in the “Bugle Corps” may be able to point out things about the Elk you never would have known. When I retire, I can see myself moving to the Smokies, and volunteering to do something similar, so I suppose that’s part of why this particular article hit home for me. Enjoy!